Draft: 2006, Baltimore Orioles, 3rd rd. Full name is Zackary Grant Britton…is married to Courtney…the couple has two children: son, Zander, and daughter, Zilah...Graduated from Weatherford (Tex.) High School…was born in California, but moved to Weatherford, Tex., during his sophomore year of high school…went to high school with Clayton Kershaw and was going to room with him at Texas A&M...Shares the same hometown of Panorama City, Calif., as teammate Giancarlo Stanton...For Players' Weekend, wore the nickname "Anglada" on his jersey as a nod to his family and grandmother's Dominican heritage…Anglada is his maternal grandmother's maiden name. Combined to go 2-0 with seven saves (in 10 chances), a 3.10 ERA (40.2IP, 14ER) and 34K in 41 relief appearances with Baltimore and the Yankees…opponents batted .201 (29-for-144, 3HR); LH .200 (9-for-45, 2HR), RH .202 (20- for-115, 1HR)…retired 27-of-41 first batters faced (65.9%)…allowed 3-of-9 inherited runners to score (33.3%)...Went 1-0 with a 2.88 ERA (25.0IP, 8ER) and 21K in 25 relief appearances with the Yankees...Went 1-0 with four saves and a 3.45 ERA (15.2IP, 6ER) in 16 relief appearances with the Orioles...Began the season on the 60-day disabled list recovering from right Achilles surgery…combined to make five rehab relief appearances with Single-A Frederick, Double-A Bowie and Triple-A Norfolk…was returned from rehab and reinstated from the D.L. on 6/11...Made his season debut on 6/12 vs. Boston, tossing 1.0 scoreless inning (3BB, 1K)…his 3BB were a relief appearance career high (matched the total in his final appearance of the season on 9/28 at Boston)...Blew his first save of the season on 6/27 vs. Seattle after allowing a two-run HR to Kyle Seager…was his second career home run surrendered to a left-handed hitter as a reliever (also Matt Olson on 8/13/17 at Oakland)…also allowed a HR to LHH Chris Davis on 8/24 at Baltimore...Made nine consecutive scoreless appearances from 6/30-7/26, going 1-0 with three saves (9.0IP, 3H, 4BB, 7K)...Was acquired by the Yankees from Baltimore for RHP Dillon Tate, RHP Cody Carroll and LHP Josh Rogers on 7/24 and added to the 25-man roster on 7/26…at the time of his trade from Baltimore (29-73 record) to the Yankees (64-36 at the time of his Yankees debut), gained 36 games in the standings…according to Elias, marked the largest win-loss improvement for a player switching teams during the season since 1904, when C/OF Doc Marshall gained 37.5 games by being traded from the Philadelphia Phillies (21-60) to the New York Giants (59-23)...Made his Yankees debut in 7/26 win vs. Kansas City, tossing a perfect eighth inning (1.0IP, 1K)...Earned his first save as a Yankee in 8/24 win at Baltimore, allowing 1ER in 1.0IP (2H, 1HR)...In 10 outings in September, he held opponents to a .088 BA (3-for-34) without allowing an earned run (9.2IP, 2R)...Appeared in four of the Yankees' five postseason games, posting a 5.40 ERA (5.0IP, 3ER) without recording a decision...On 1/11/19, was signed by the Yankees to a three-year contract extending through the 2021 season with a team option for 2022, which the club must exercise or decline following the 2020 season…if the Yankees decline the 2022 team option following 2020, he may elect to become a free agent for the 2021 season. Went 2-1 with 15 saves and a 2.89 ERA (12 ER/37.1 IP) in 38 appearances...Converted his 55th consecutive save opportunity on 7/23 to set a new American League consecutive save opportunities record, passing RHP Tom Gordon (54, 4/19/98-5/31/99)...Converted 60 consecutive save opportunities from 10/1/15-8/21/17, the second-longest streak in Major League history (Eric Gagne, 84 consecutive, 8/28/02-7/3/04)... Threw at least 2.0 innings in back-to-back appearances (9/1 vs. TOR and 9/3 vs. TOR) for the first time since 4/12/14 vs. TOR 2.0 innings and 4/16/14 vs. TB 3.0 innings...Gave up a home run to Matt Olson on 8/13 at OAK; was his first home run allowed of the season, and first since 4/11/16 at BOS-M. Betts (89 appearances); first home run allowed to a lefty since 4/29/13 (M. Saunders)...Placed on the 10-day DL on 5/6 (retroactive to 5/5/17; left forearm strain)...Transferred to the 60-day DL on 6/20... Placed on the 10-day DL on 4/16 (left forearm strain)…Reinstated from the DL on 5/2...His 135 career saves rank second among Orioles relievers in club history…Gregg Olson (160) holds the club record...His 135 saves since the start of 2014 lead all American League relievers (fourth in the majors)...One of 18 active pitchers with 100-or-more career saves. Named the Mariano Rivera American League Reliever of the Year...Selected to the 2016 All-Star Game, his second consecutive All-Star selection (second career, also 2015)...Earned the save for the AL squad (1.0 IP, 1 H)... Ranked frst among qualifying relief pitchers in the majors with a 0.54 ERA (4 ER 67.0 IP)...He was the only qualifying reliever in the majors with a sub-1.00 ERA...His 0.54 ERA led all Major League pitchers (min. 50.0 IP) and was the lowest in Major League history with at least 50.0 IP...Ranked frst among Major League relievers in ground ball fy ball ratio (9.77) and in ground ball percentage (79.4%) ...Posted a Major League record 43 consecutive relief appearances (41.1 IP) without surrendering an earned run from 5/5-8/22, according to STATS, LLC. (since 1913)... Went 47-for-47 in save opportunities this season...His 47 saves led the AL and ranked tied for second in the majors... Posted the fourth 40-save season in O's history (R. Myers, 45 saves in 1997; J. Johnson, 51 saves in 2012, 50 saves in 2013)... Was the only qualifying reliever in the majors with a 100.0% save percentage • Set the club record for consecutive saves in as many opportunities to begin a season (47-for-47), surpassing Chris Ray's mark (18-for-18) from 4/3-6/17/06... With his save on 8/3 vs. TEX, he set the Major League record (since 1969) for most consecutive saves (33) in as many chances to begin a season by a left-handed pitcher, according to STATS, LLC....According to STATS, LLC., he posted the third-longest stretch of consecutive saves converted to start a season (47) in Major League history (since 1969)... Earned the 100th save of his career on 7/10 vs. LAA, becoming the ffth pitcher in club history (since 1954) to record 100 or more career saves with the Orioles... Posted his 106th career save on 8/3 vs. TEX, passing Tippy Martinez for the club record for saves by a left-handed pitcher... His 120 career saves are the third-most among Orioles relievers in club history (since 1954)...Jim Johnson (122) ranks second... His 120 saves since the start of 2014 lead all American League relievers (fourth in the majors)...Is one of 20 active pitchers with 100 or more career saves... Since the start of 2014, ranks second among qualifying relievers in Major League Baseball with a 1.38 ERA (32 ER/209.0 IP)...Appeared on the Orioles' 2016 AL Wild Card Game roster. Pitched exclusively out of the bullpen for the 1st time, pitching to a 0.84 ERA (21.1IP, 2ER) in his 1st 16 appearances (March 31-May 10). Earned his 1st career save, May 15 @KC (perfect IP on three ground ball outs in a 2-1 win) and held the closer job for the rest of the season. Finished fourth in the AL with 37 saves…Converted 18 consecutive save opportunities, July 19-September 4. Led all relievers in groundball-to-flyball ratio (6.68) and ground ball percentage (75.8%). Became the 10th different Oriole to record a 30-save season, August 30 vs. MIN…It is the 14th 30-save season by an Oriole. Became the seventh AL left-hander to save 37 or more games in a season, the second Oriole (Randy Myers - 45 in 1997). Posted a franchise record 35.1 consecutive scoreless innings at home, September 27, 2013-August 3, 2014. His stretch of 27 straight scoreless home appearances (September 27, 2013-August 3, 2014) tied the club record. Pitched 1.0 inning or more in 64 of his 71 appearances (eighth in MLB/third in AL), going 2-0 with 35 saves and a 0.86 ERA (73.1IP,7ER) in those 64 outings. Appeared in six postseason games, posting a 3.86 ERA (4.2IP, 2ER) with two saves (Games 2 and 3 of the ALDS). Allowed one earned run over his first two major league appearances (13.2 IP)...According to Elias, since the Orioles moved to Baltimore in 1954, only Tom Phoebus won his first two MLB games, both as astarting pitcher, allowing no more than one run combined...Prior to Britton, the last Oriole pitcher to allow one or fewer runs in the first 13.2 innings of his career was Kurt Birkins in May2006 (he allowed one run, all innings pitched in relief)...The last O's pitcher to allow a total of one-or-fewer runs in his first twocareer starts was Chuck McElroy in Sept. of 2000 (11.0IP, 1ER)...McElroy had 603 relief outings in the bigs before his first twostarts in 2000...Worked nine scoreless innings in that May 12 start and was opposed by Jason Vargas, who also worked nine scoreless innings...The last time the Orioles played a game in which both pitchers went nine innings was July 11, 2003 (Baltimore's Rodrigo Lopezand Oakland's Tim Hudson)...It also marked the first time two major league pitchers went nine innings or more each and wereboth non-decisioned since July 10, 2010 (Philadelphia's Roy Halladay and Cincinnati's Travis Wood)...It was just the third suchoccurrence in the big leagues since 2000...The last O's starter to throw nine shutout IP and not factor in the decision was MikeMorgan on April 16, 1988 against Cleveland...Joined Jake Arrieta as the first pair of Oriole starters to both have five wins by May 20 since Erik Bedard (5) and Kris Bensonin 2006...Recorded five hits in his three Interleague Play starts, going 5-for-8 with a double, a homer with two RBI and three runs scored...According to Elias, his five hits were the most in one season by an AL pitcher since the creation of the designated hitter in 1974...Set a career-high with three straight wins April 20-May 1 and tied that mark August 22-September 1...Struck out a career-high seven September 17 against Los Angeles...Had a streak of 19.1 scoreless innings over three starts from May 6-18...In his two starts, July 8-30, he became the first player in major league history to allow eight-or-more runs while lasting less thanan inning in each of two consecutive starts...In his August 28 start against the Yankees (over 7.0 innings) he threw a career-high 120 pitches, the most by an Oriole pitcherin 2011 and most by an Orioles starter against the Yankees since Sidney Ponson threw 128 in 5.2 innings on June 1, 2004 inthe Bronx...Pitched to a 3.09 ERA (87.1IP, 30ER) at home and a 6.58 ERA (67.0IP, 49ER) on the road...Was 3-1 with a 2.02 ERA (35.2IP, 8ER) in five starts against the AL West...Had a 4.05 ERA (104.1IP, 47ER) before the All-Star break, but pitched to a 5.76 ERA (50.0IP, 32ER) after the break...Was 4-1 with a 2.84 ERA (31.2IP, 10ER) in five April starts and 2-1 with a 2.60 ERA (17.1IP, 5ER) in three August starts...Opponents batted .228 (72-316) against him at home and .331 (90-272) on the road...Made one start for Triple-A Norfolk August 16 and allowed one run over five innings on three hits and a walk against Charlotte...Made three starts for Double-A Bowie July 15-25, going 0-2 with a 5.40 ERA (11.2IP, 7ER). Was named the Carolina League Pitcher of the Year...Was named to the Carolina League mid-season All-Star team andthe Carolina League post-season All-Star team...Was named the third best prospect in the Orioles system by Baseball America...Finished second in the league in ERA (2.70) and strikeouts (131), fourth in innings pitched (140.0) and tied for fifth in wins (9)... Led the Keys in all four categories...Also led the team in games started (24)...Tied a career-high with nine strikeouts June 29 against Wilmington...Began the season with five consecutive starts allowing two earned runs or less and ended the season with nine consecutive starts allowing three earned runs or less. Finished seventh in the league in ERA (3.12) and fourth in innings pitched (147.1)...Tied for team lead in wins (12) andstarts (27) and finished second on the club in strikeouts (114)...Threw a complete game (7.0 IP) on May 21 against Kannapolis,allowing one run on five hits...Made 15 quality starts and struck out a season-high nine batters on June 25 against Lake County. Went 6-4 with a 3.68 ERA in 15 starts for Aberdeen...Pitched to an 8.00 ERA in June (9.0IP, 8ER), but had a 2.96 ERA(54.2IP, 18ER) after July 1. Went winless in 11 starts for Rookie League Bluefield...Lost 3 straight starts, July 30- August 10...Pitched a season-high5.0 innings and did not allow a run on 8/15 at Pulaski, but did not receive a decision...Surrendered 5 runs in 1.2 innings in his next start at Burlington, the only time he allowed more than 3 runs in an outing. January 11, 2019 New York Yankees signed free agent LHP Zack Britton. October 29, 2018 LHP Zach Britton elected free agency. 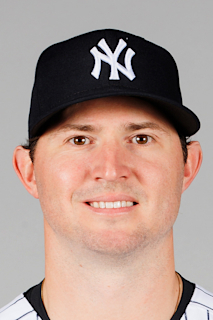 July 26, 2018 New York Yankees activated LHP Zach Britton. July 24, 2018 Baltimore Orioles traded LHP Zach Britton to New York Yankees for RHP Cody Carroll, RHP Dillon Tate and LHP Josh Rogers. June 11, 2018 Zach Britton roster status changed by Baltimore Orioles. June 5, 2018 Baltimore Orioles sent LHP Zach Britton on a rehab assignment to Norfolk Tides. June 1, 2018 Baltimore Orioles sent LHP Zach Britton on a rehab assignment to Bowie Baysox. May 30, 2018 Baltimore Orioles sent LHP Zach Britton on a rehab assignment to Frederick Keys. February 15, 2018 Baltimore Orioles placed LHP Zach Britton on the 60-day disabled list. Right Achilles surgery. July 5, 2017 Baltimore Orioles activated LHP Zach Britton from the 60-day disabled list. June 30, 2017 Baltimore Orioles sent LHP Zach Britton on a rehab assignment to Frederick Keys. June 26, 2017 Baltimore Orioles sent LHP Zach Britton on a rehab assignment to Bowie Baysox. June 22, 2017 Baltimore Orioles sent LHP Zach Britton on a rehab assignment to Delmarva Shorebirds. June 20, 2017 Baltimore Orioles transferred LHP Zach Britton from the 10-day disabled list to the 60-day disabled list. Left forearm strain. June 19, 2017 Baltimore Orioles sent LHP Zach Britton on a rehab assignment to Aberdeen IronBirds. May 6, 2017 Baltimore Orioles placed LHP Zach Britton on the 10-day disabled list retroactive to May 5, 2017. Left forearm strain. May 2, 2017 Baltimore Orioles activated LHP Zach Britton from the 10-day disabled list. April 28, 2017 Baltimore Orioles sent LHP Zach Britton on a rehab assignment to Bowie Baysox. September 21, 2013 Baltimore Orioles recalled LHP Zach Britton from Aberdeen IronBirds. September 5, 2013 Baltimore Orioles optioned Zach Britton to Aberdeen IronBirds. September 2, 2013 Baltimore Orioles recalled Zach Britton from Norfolk Tides. July 10, 2013 Baltimore Orioles optioned Zach Britton to Norfolk Tides. June 18, 2013 Baltimore Orioles recalled Zach Britton from Norfolk Tides. April 30, 2013 Baltimore Orioles optioned Zach Britton to Norfolk Tides. April 25, 2013 Baltimore Orioles recalled Zach Britton from Norfolk Tides. March 23, 2013 Baltimore Orioles optioned Zach Britton to Norfolk Tides. October 13, 2012 Zach Britton roster status changed by Baltimore Orioles. October 7, 2012 Baltimore Orioles reassigned LHP Zach Britton to the minor leagues. September 7, 2012 Zach Britton roster status changed by Baltimore Orioles. September 4, 2012 Baltimore Orioles recalled Zach Britton from Norfolk Tides. September 4, 2012 Baltimore Orioles activated LHP Zach Britton. August 31, 2012 Baltimore Orioles optioned Zach Britton to Norfolk Tides. August 18, 2012 Baltimore Orioles recalled Zach Britton from Norfolk Tides. August 8, 2012 Baltimore Orioles optioned Zach Britton to Norfolk Tides. August 4, 2012 Baltimore Orioles activated LHP Zach Britton. July 17, 2012 Baltimore Orioles recalled Zach Britton from Norfolk Tides. June 6, 2012 Baltimore Orioles optioned Zach Britton to Norfolk Tides. June 5, 2012 Bowie Baysox sent LHP Zach Britton on a rehab assignment to Norfolk Tides. June 3, 2012 Zach Britton roster status changed by Baltimore Orioles. May 26, 2012 Zach Britton assigned to Bowie Baysox. March 26, 2012 Baltimore Orioles placed LHP Zach Britton on the 15-day disabled list. Left shoulder impingement. August 22, 2011 Baltimore Orioles activated LHP Zach Britton from the 15-day disabled list. August 16, 2011 sent LHP Zach Britton on a rehab assignment to Norfolk Tides. August 5, 2011 Zach Britton roster status changed by Baltimore Orioles. July 30, 2011 Baltimore Orioles recalled LHP Zach Britton from Bowie Baysox. July 9, 2011 Baltimore Orioles optioned Zach Britton to Bowie Baysox. April 3, 2011 Baltimore Orioles recalled Zach Britton from Norfolk Tides. March 29, 2011 Baltimore Orioles optioned Zach Britton to Norfolk Tides. November 19, 2010 Baltimore Orioles selected the contract of LHP Zach Britton from Norfolk Tides. November 9, 2010 Baltimore Orioles reassigned LHP Zach Britton to the minor leagues. July 1, 2010 Zach Britton assigned to Norfolk Tides from Bowie Baysox. April 8, 2010 Zach Britton assigned to Bowie Baysox from Frederick Keys. August 3, 2009 Zach Britton assigned to Aberdeen IronBirds. August 3, 2009 Zach Britton assigned to Aberdeen IronBirds from Frederick Keys. April 8, 2009 Zach Britton assigned to Frederick Keys from Delmarva Shorebirds.